If, when leaving the screen after viewing Legend, you and your fellow film-seer discussed what you had just seen for ten minutes, nine of those minutes would be spent discussing Tom Hardy, and only one minute would be left to talk about the actual film. Normally this would be an unfair approach to discussing a film; acting is, after all, just one element of film-making. But Legend is one of few exceptions to that rule, and for a very simple reason. Tom Hardy's double performance as the Kray twins is better than this film about the Kray twins. That's not to say Legend is a bad film, because it's actually a rather good one, it just doesn't seem to understand how powerful its own story and characters are. 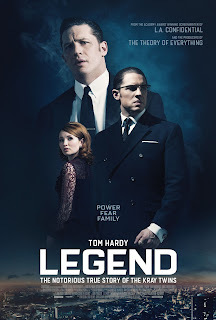 Tom Hardy keeps things interesting throughout the film's two hour run time, and there are occasional flashes of excellence scattered throughout, but Legend is one of those frustrating films that could have been something fantastic but just falls short. Telling the undeniably fascinating story of the Kray twins, Legend is a gangster biopic that does pack a punch, even if it doesn't entirely feel earned. The film's biggest issue is its failure to understand its own characters, despite how well performed they are. Writer-director Brian Helgeland does an acceptable job of defining the two brothers, Ronnie and Reggie, early on in the film, but they run out of steam by the time we reach the half way point. As narrative setup the brothers are written well, but when the film reaches the stage where their lives are beginning to fall out of hand and everything begins going from bad to worse, the script doesn't do the events justice. We don't get an appropriate insight as to what is making these brothers explode, and why it is having that effect on them. The same can be said for Reggie's wife Frances (Emily Browning); we're given plenty of expositional dialogue about her deteriorating mental state, but it isn't portrayed well enough on screen. It's constantly alluded to without any real evidence, so when her story reaches its conclusion its hefty emotional weight is surprising, but feels woefully unearned. As stated earlier, Legend does offer flashes of brilliance, it's just frustrating that you have to wait about twenty minutes between each offering. Whilst the film tries to be a character piece, it is at its best when something violent and dark is taking place. Ronnie and Reggie's brawl in the club is a horrible moment to watch, but its underscored with comic flashes. Legend is, ultimately, quite a funny film, Hardy makes sure of that. Had this film been entirely serious it wouldn't have worked, so lacing the darker moments with small bits of humour was a smart touch, and it helps boost some ordinary scenes into something really enjoyable. Most of the humour stems from Ronnie and his knack for just saying what he thinks, even if it can hurt people, but the film understands that he shouldn't really be laughed at. Whilst the humour stems from what he says, we laugh more at how people react to him and the situations he puts others in. Without this, Legend would be quite an enduring experience, but despite it forcing the film into occasional tonal imbalances, it makes the story more enjoyable and, ultimately, more interesting. Legend does get by mostly on the strength of its performances; Tom Hardy is exceptional as both brothers. Even when the script fails him, he finds ways of blurring the lines between them. While Reggie predominantly acts as the cool, calmer brother and Ronnie is the psychotic sibling who needs to be kept in check, Hardy finds ways of letting the lines cross over. Even if the script doesn't truly understand that these two are brothers, Hardy's performance enforces it enough to just about make it believable. He is worth the ticket price alone. Emily Browning is also excellent as Frances, her fragility and delicacy underplayed with both warmness and softness. Her dry, almost monotonous delivery of the film's narration works in its favour, she allows the story to feel more fluid when the pacing is beginning to fall apart. The acting is solid all round, really, but Legend is unquestionably Hardy's film, adding darkness and humour to scenes that could have otherwise felt bland or uninspired. When all else fails, and there are odd moments where the film doesn't work at all, he will keep you interested. Something about Legend just doesn't sit right. It's tone flies all over the place, the story takes a while to feel like it's moving and the scripting doesn't seem to respect the characters it's offering. But it's simultaneously a compelling film, thanks mostly to its determined performances and bold approach to violence and gangster crime. It's almost as if everything in the film, besides its performances, are entirely half baked; all the groundwork is there, but it just doesn't hit the heights it should do. The Angelina Jolie directed Unbroken suffered similar traits to Legend; both are incredible true stories, but not told with the conviction they deserve. Legend is an interesting film, and one that probably warrants a repeated viewing to take in more of Hardy's stellar performances, but it just doesn't push hard enough to be anything special. It's compelling in the moment, and you'd struggle to feel bored at any stage, but it won't have you darting for Wikipedia in desperation to know everything about the Kray twins as soon as you get home. In fact, you're more likely to be on Tom Hardy's page than the characters he's portraying. There are flashes of brilliance, and everything in between is just about good enough, but the Krays' legend deserved better than Legend. To Summarise: Its unbalanced script and sketchy pacing don't do it any favours, but Legend is an interesting gangster biopic bolstered by excellent performances from its leads and a compelling true story to tell.